Lowest prices and the best selection of snowmobile clothing, gear, parts, manuals, and supplies. Shop here for helmets, jackets, seats, drive belts, snowmobile covers or trailers, and you'll find the best deals. Whether you're rebuilding a Yamaha SRX 440 or you just want a new Arctic Cat team jacket, we have what you need for your Ski-Doo, Polaris, Deere, or any other sled, including vintage shop manuals, promotional material, and more. 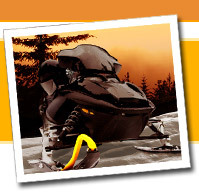 If you want to buy a new or used snowmobile, check out our Snowmobiles For Sale section. For bargains on everything for snowboard shredders, visit our sister site, Bindings for Snowboards � offering great deals on Burton, Rossi, Lib Tech/Gnu decks and gear and everything needed by snowboarders. Roetin Industries 025-635 Wear Runner 3 Bolts - 20in.